Are you aware of the four thieves legend? You may have seen ads on the internet or print magazines pitching Four Thieves oil, an essential oil remedy that was supposedly created during one of the plagues hundreds of year ago. It’s a story that has several versions, so I’ll summarize what is the same in all versions. 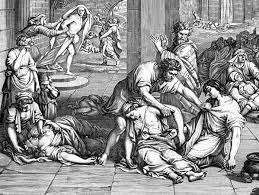 Four thieves who had access to herbal knowledge conspired to take advantage of the chaos, illness, and death inflicted by the plague. Several others were thieving amongst them, but few survived. Among the survivors were the four thieves, and among them were a couple of guys who were herbalists and perfumers. 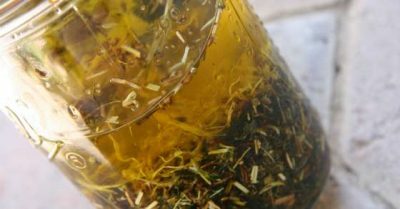 What they did was develop a blend of herbs that would protect them from the plague, rub it on themselves and perhaps ingest it in order to go into homes with the sick and dying or dead and take whatever they wanted with impunity, not only from being stopped by the victims, but also immune to their diseases. The deal was struck. One more popular version has them set free; another has them all hung despite the deal struck between them and whoever was the law enforcer there. Nice little story that could motivate you to buy some Four Thieves Essential Oil Blend right away and use it for aromatherapy. Worth a try maybe, right? Essential oils should be applied via aromatherapy or topically and not ingested. You can also add a cup of vinegar to make it into a topical spray, according to Jesse Hawkins. But if you prefer to make the Four Thieves vinegar that can be consumed orally or applied topically, here’s how. You can get the following herbs locally or shop online. Mountain Rose Herbs in Oregon has an excellent online store. -16oz raw organic apple cider vinegar, make sure it is unfiltered with the “Mother”. Place the herbs in a pint jar and fill to the top with gently warmed (not boiling) apple cider vinegar. Close with a plastic lid or place a piece of natural parchment paper under a metal lid to keep the vinegar from touching the metal. Allow to extract for four weeks, gently shaking occasionally. Strain the vinegar into a clean glass jar. Store in a cool, dark area. This is a popular use. Wellness Mama recommends putting 1/4 cup into a spray bottle that you fill with water. Then it can be sprayed on skin and/or clothes to keep the “skeeters” away. It should be diluted somewhat to use as a foot soak for toenail fungus or athlete’s foot. You can also dilute the solution to treat dandruff. Dilute it and spray on surfaces. The month of seasoning reduces it’s acidity enough to use on delicate surfaces, according to one source. Take one or two tablespoons with honey often throughout the day. To avoid illnesses that are “going around”, it’s sufficient for one dose daily to use as an immune boosting tonic. Next articleToenail Fungus Treatment: 3 Steps to Get Rid of It Fast!